The ever-popular panther represents the epitome of sumptuousness. While retaining the charm of the BijouMontre collection, it exudes extravagant wildness. 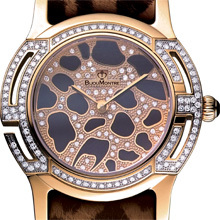 The dial is irresistibly charming and displays an ingenious array of gems, enamel and diamonds. The watch bezel sharply accentuates the watch positions of 3 and 9 on the left and right, while the inlaid Top Wesselton/VS diamonds demonstrate BijouMontre’s outstanding craftsmanship. Black enamel with an animal pattern in the dial.